Home » General Interest » How does a Microwave Oven Work ? Microwaves, like radio waves and light, are a form of electromagnetic radiation. Electromagnetic waves are wavelike oscillations of electric and magnetic fields. The microwaves used to heat food in microwave ovens have a wavelength of 12.2 cm and oscillate at a frequency of 2.45 gigahertz. Giga means billion, so the electric and magnetic fields oscillate fast enough to make 2.45 billion complete cycles each second. Microwave heating works by heating the water in foods. The frequency used in microwave ovens optimally heats water molecules. It is also works to a lesser extent on fats and sugars. The microwave energy is converted into heat energy of the water molecules, which in turn heat the other molecules in the food. That is why dry foods such as rice and pasta will not cook in a microwave unless they are in some water. 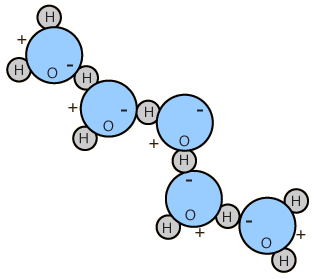 A water molecule consists of three atoms: Two hydrogen atoms and one oxygen atom. These atoms share their electrons in such a way that the positive charges are on one side of the water molecule and the negative charges are on the other side. Chemists call this a polar molecule. Water molecules are polar molecules. Like charges repel each other and unlike charges attract. Because microwaves are electromagnetic waves they produce constantly changing electric fields in the food inside the microwave oven. The water molecules in the food react to the electric field by rotating to minimize the force on both the positive and negative ends of the molecule. When the electric field changes from positive to negative, as it does with an electromagnetic wave, the water molecules rotate again and orient themselves in the opposite direction. As the water molecules rotate, they bump other molecules causing them to begin moving randomly. The process is like frictional heating. Microwave energy converts to heat energy by causing the molecules in food to increase the speed of their random motions. Like many great inventions, microwave ovens were an accidental discovery. During the 1950s, American electrical engineer Percy Spencer (1894–1970) was carrying out some experiments with a magnetron at the Raytheon Manufacturing Company where he worked. At that time, the main use for magnetrons was in radar. One day, Percy Spencer had a chocolate bar in his pocket when he switched on the magnetron. To his surprise, the bar quickly melted because of the heat the magnetron generated. This gave him the idea that a magnetron might be used to cook food. After successfully cooking some popcorn, he realized he could develop a microwave oven for cooking all types of food. He was granted a series of patents for this idea in the early 1950s, specifically one for “Method of Treating Foodstuffs” which detailed the basic operation of a microwave oven.